The AAC is pleased to welcome Professor Emswiler of the University of South Carolina- Union as juror for this application process and day of the event. This is an annual event; submission are no longer accepted for 2019. It’s never too early to begin creative works for entry in 2020! Sculpture artist Sayaka Ganz will discuss her work at 7 p.m. June 28 at Eckhart Public Library, 603 S. Jackson St., Auburn, Ind. Sculpture artist John Mishler will discuss his work at 6:30 p.m. July 21 at the Community Foundation of DeKalb County, 700 S. Main Street, Auburn, Ind. 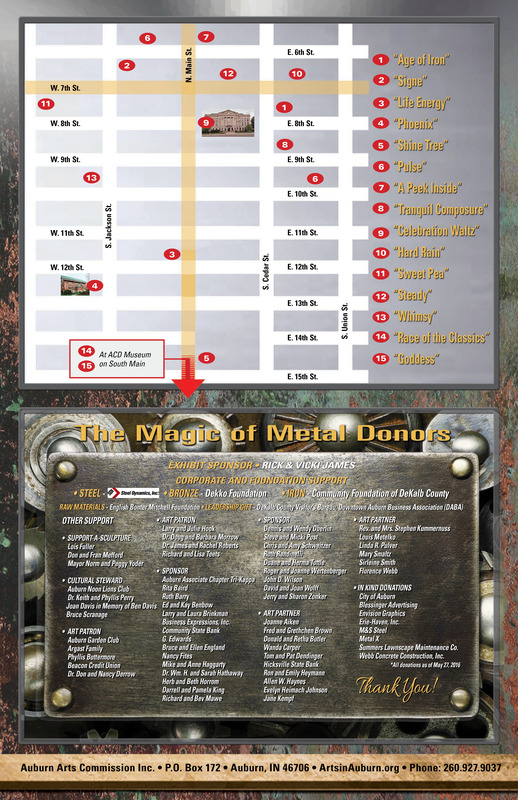 Download The Magic of Metal schedule and map by clicking the image below, or pick up a copy at multiple locations in DeKalb County. 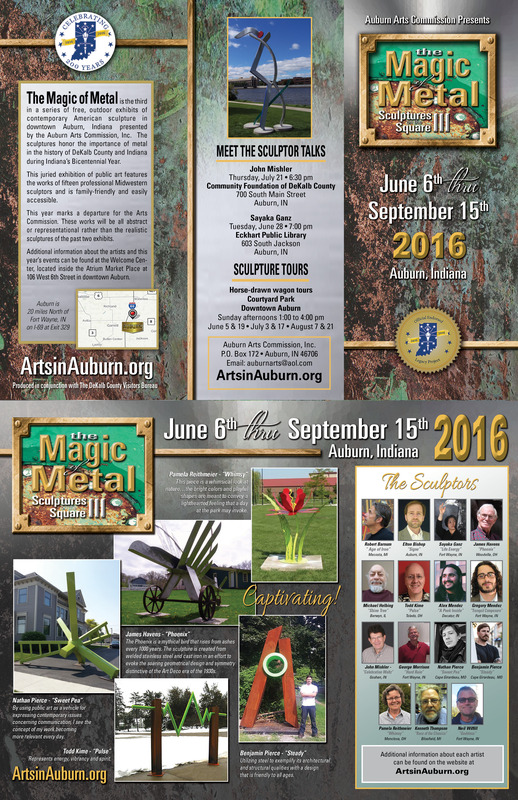 As of Feb. 19, “Sculptures on the Square III: The Magic of Metal” was approved as a Bicentennial Legacy Project by the Indiana Arts Commission. The Indiana Bicentennial Commission recognizes there are abundant opportunities for local and regional Bicentennial celebrations, projects and programs to reflect upon 200 years of progress with genuine Hoosier pride and ingenuity. The Auburn Arts Commission is proud to be granted this approval.